This game is not one of those conventional counter strike shooting games, but it's just as addicting and fun as any one of the “standard” ones! Somewhere in the desolate mountains of the east, a small country is shredded by a raging civil war. The civilians are divided into two camps viciously fighting against one another. One camp is supported by the army and the police is well armed, but the guerrilla camp is ingenious and resourceful, planning terrorist attacks and creating much chaos. Count and strike will bring out the hero in you and perfect your first person shooter skills. 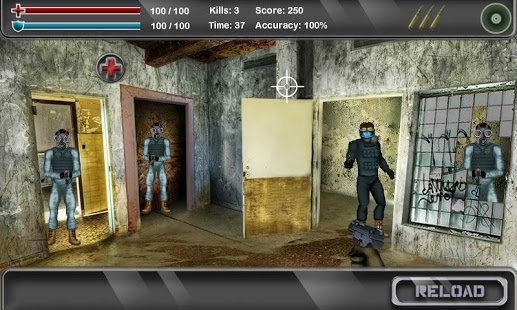 You have ten different locations where the terrorists and the army are in standoffs and it's your duty to take them all out while responding to the challenge prepared for you in what seems to be one of the most engaging shooting games for Android! You'll be playing the role of character Sniper Jax, a soldier in the United Continents army who aims to kill fast. Offense oriented, he has the temperament of flaming sandpaper and his aim is to take out everyone. Rejected from his county's military for inappropriate behavior, he somehow made it to the United Continents hired army and is on a mission to set things straight. His stay in the forces has earned him various medals as a stoic right-on shooter that doesn't miss one enemy. His favorite weapon is the SAW 86 LMG, a trustful companion that uses hammer-type firing mechanism and a trigger that enables semi automatic and fully automatic firing. 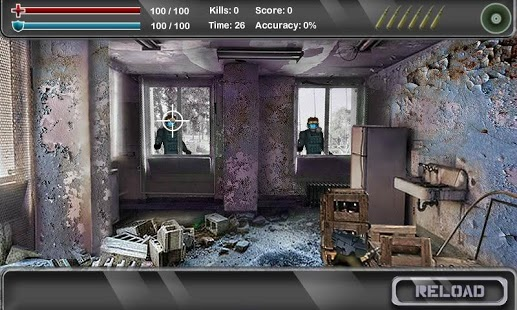 If you already play online sniper games on a regular basis, you're the right expert to judge the virtual weaponry put at your disposal as being one of the coolest ones you've ever got the chance to handle while having fun online!The machine gun feeds from a round box made of resistant metal with a 30 round capacity of cartridges. Its a very powerful weapon, but to get to it you will have to earn enough money. So, jump in this adrenaline summoning adventure, after you've downloaded this adrenaline-packed shooting game on your Android phone, and get ready to sharpen your first person shooter reflexes. He is here to fight the forces of chaos and restore order in the country. Your job is to take out all the soldiers and the terrorists on site and gather as much money as possible to get to the increasingly powerful guns. You start off with the Walter that has only 6 cartridges, advance to a SM 55 Carbine and than can finally handle the SWG 86 LMG. The two camps you are fighting against have the reputation of the highest number of kills in the shortest time. Training camp is over and you have to get directly in the field once you've embarked on the dangers-filled adventure prepared for you in this game, probably soon to become one of those top-rated shooting games for Android. Unlike in Combat Arms or Soldier Front, while playing the count and strike game you have to fight only these two extremist organizations and put an end to the injustice and chaos in this urban terror. Get ready for sudden attacks and blazing cartridges coming your way. Make sure you fire at the shield and health icons appearing randomly in the field to top up on health and endurance in the combat field. 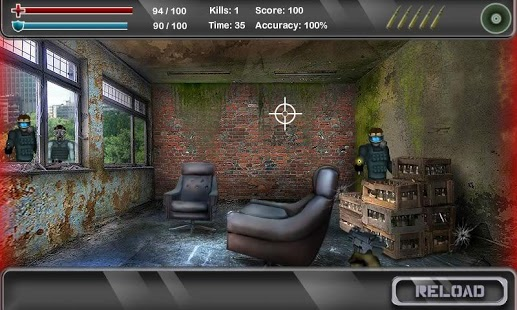 If you've always secretly fancied yourself as a super skillful sniper, a well trained shooter, then you will no doubt place this game on your top favorite free shooting games list!You will be able to listen to your call of duty and kill these vicious combatants versed in modern warfare and wont back down. The situation is tense and the urban scene is under terror from the terrorists bringing death and instability in the region.